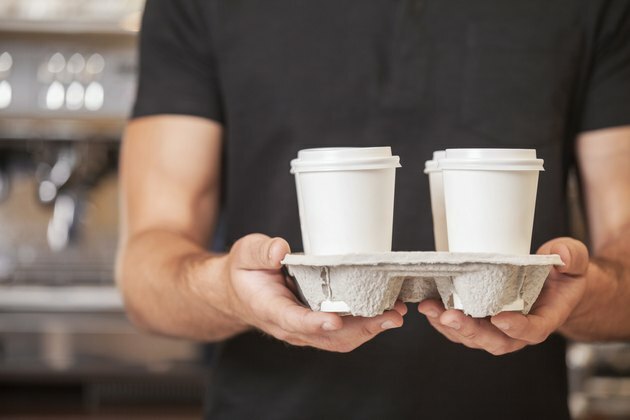 Can Drinking Too Much Caffeine Affect Your Kidneys? Caffeine may be the most common drug in the human food supply. That mug of breakfast coffee, the cup of tea in the afternoon and the energy drink or cola on a hot day all contain caffeine. You may think of caffeine as a mild stimulant and use it for that purpose, but caffeine affects the whole body, including your kidneys. Caffeine consumption has been linked to kidney stones. Calcium oxalate stones, the most common type of kidney stone, are formed from the combined crystals of calcium and oxalate. In a study reported in the August 2004 "Journal of Urology," study participants who had a history of calcium kidney stones but normal serum calcium levels were given 6 milligrams of caffeine per kilogram of body weight after fasting for 14 hours. The caffeine increased urinary calcium levels, causing researchers to conclude there was a modest increase in the risk of developing calcium oxalate kidney stones after caffeine consumption. Caffeine, which belongs to a class of substances called methylxanthines, is a mild diuretic. Theophylline, another drug in this class, was actually used as a diuretic until more potent diuretics were developed. Both of these drugs act on the kidneys by preventing absorption of water. Research reported by R.J. Maughan and J. Griffin in the December 2003 "Journal of Human Nutrition and Dietetics" noted that people who had not had any caffeine for a few days had increased urinary output after drinking the amount of caffeine equivalent to two to three cups of coffee. However, Maughan and Griffin went on to say that the dangers of caffeine-caused diuresis have been overrated. They reviewed many scientific articles published on caffeine and fluid balance that were published between 1966 and 2002. The review showed that although large doses of caffeine taken in a short period of time can stimulate urine output, people quickly develop tolerance to the effects of the caffeine, diminishing the diuretic effect in those who regularly consume coffee or tea. Maughan and Griffin concluded the caffeine doses found in standard servings of caffeinated beverages such as tea, coffee or energy drinks would not affect fluid balance. Caffeine may make renal failure worse. Researchers noted in the 2007 issue of "Renal Failure" that previous studies had shown caffeine exacerbates renal failure if there is kidney disease in combination with metabolic syndrome. In experiments on diabetic rats, the researchers found that within two weeks of starting on caffeine the rats developed increased protein in the urine and increased heart rate. In addition, the arteries in the kidney became less flexible, which can increase blood pressure, although the rats in the study did not show signs of increased blood pressure. Caffeine in moderate doses – the University of Illinois suggests 200 to 300 milligrams of caffeine a day – probably won't cause health problems. The amount of caffeine suggested is the equivalent of one or two cups of coffee, three cups of tea or three 12-ounce soft drinks. And don't forget other sources of caffeine, such as energy drinks, chocolate, cocoa and some medications, including over-the-counter pain medications. Does Caffeine Make You Urinate More? Do Coffee and Caffeine Cause Kidney Stones?